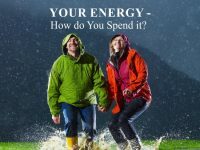 YOUR ENERGY - How do You Spend it? Sarah had a long day Monday. She got lots done and felt good from all she accom­plished, but she was tired so she went to bed early. When she woke Tuesday, Sarah felt restored, but for some reason, the day ended up being sig­nificantly harder than the one before. Someone was parked in her stall when she got to work and then there was a conflict with a co-worker. During lunch, her sister-in-law called seeking support for her struggling marriage with Sarah’s brother. The rest of the day was challenging and Sarah became physi­cally drained and felt stressed and discouraged. “I wish I could go home to bed,” Sar­ah thought. But there were still two more hours at work, then the kids needed to be picked up, fed and taken to practice. When the day finally ended, Sarah closed her bedroom door and dropped onto the bed. Her daughter was probably still texting her friends in­stead of doing her homework. Sighing to herself, Sarah let it pass, too worn to deal with anything else. This is Sarah’s story: some days her energy gets her through her day and other times she’s depleted by noon. How you consume your daily energy may not be exactly like Sarah’s, but what’s common for most of us is how certain things deplete our energy and leave us susceptible to physical fatigue, feelings of stress, and discouragement. Being aware of exactly what type of events deplete us is hard to do. Even if we know which activities deplete our energy, it’s often hard to avoid them. If only we had a fuel gauge like on a car that helped us measure how quickly things were drain­ing our energy. We could then eliminate those things or, at least, choose how and when to deal with them. Your mind and body are much like any device that uses energy. The harder it works the more energy it burns. On Sarah’s good day, she had plenty of energy and accom­plished everything she wanted to. She felt good about herself and content with her work. Her rela­tionships were peaceful and she was thankful as she fell asleep. But difficulties Sarah ex­perienced the next day caused bouts of feeling angry, shame and stress. Worse, she couldn’t shake it off. Her energy levels declined as the day went on. In other words, Sarah’s psychologi­cal state played the major role in determining her daily energy lev­els. That’s typical for most of us. Is there a different way to approach our challenges? If only I could eliminate the challenges in my life and fill my days with mostly good things. Then I would start feel­ing better and stop feeling my energy draining away. Unfortunately, that’s not possible. That’s not how energy and happiness work. Life is al­ways a blend of good things and difficult challenges. Accept­ing this will help you to develop the skills needed to get through those challenges more quickly and lessen their impact on your energy levels. In other words, reacting to a difficult situation with a negative “I Hate It” percep­tion only strengthens its ability to cause increased frustration. It’s like driving a car down the freeway in first gear. The engine screams and progress is slow. When you shift into a higher gear, progress improves, there’s less wear on the vehicle, and energy consump­tion becomes more economi­cal, letting you travel further. Is there a higher psy­chological “gear” we can shift our lives to? Each morning you wake with a limited amount of energy. If you spend it all before the day is over, the result will be higher amounts of physical fatigue and lower emo­tional tolerance for difficult things and hard decisions. Yet, it is pos­sible to live in ways that conserve your energy and increase your power to do what you need to do, while maybe helping others too. Budgeting your energy first, and not just your time, produces real rewards. how to gain awareness of your daily energy levels. how to recognize activi­ties that deplete your en­ergy and how they affect you physically and mentally. how to face challenges with­out depleting your energy. When our energy is low, we’re susceptible to an es­calated psychological state. Just knowing that can make a difference in how we feel. A USA study indicates that 37% of workers suffer from fatigue. We understand the benefits of budgeting our money; manag­ing our income and expenditures help to create financial growth. Some people manage their time to increase their efficiency in ac­complishing more. Budgeting your energy produces real rewards. You can practice rejuve­nation activities to ward off energy depletion and even add to your energy reserves when difficult events occur. Just like people pay the mort­gage and utilities first, invest your energy in higher priorities first. Things like busyness, work/life imbalance, loneliness, and decision-making fatigue can reduce your energy levels. Like a person at a gym, using our energy doesn’t have to de­plete us; it can strengthen us. Would learning how to man­age your daily energy levels be something you could benefit from? If so, read on and together, with your other Credit Union co-workers, learn what kinds of things deplete your energy levels and which things con­serve or even replenish them. Vic is President of Health Factors where he leads a team of clinical researchers whose focus is keeping abreast of the latest findings in the field of advanced behavioral science, to increase treatment effectiveness. Vic is also Clinical Director at the Alive Wellness Centre, an in-patient program for people seeking mental health well-being. Health Factors has been internationally recognized and used in 23 countries by both private and government clinics, insurance companies, and university clinical training programs and has received the following awards and recognition: The United Kingdom Medipex National Health mental health Innovation of the year Award. Placed on the SAMHSA National Registry of Evidence-based Practices. Received three Benjamin Franklin publishing awards. Approved US Military contractor and used on more than seven military bases. Selected partner with Mental Health Commission of Canada to promote workplace best practices.